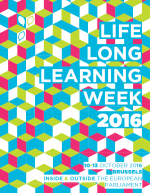 The Lifelong Learning Platform (LLLP) will be holding its 6th Lifelong Learning Week (LLLWeek) from 10th October to 13th October 2016 in Brussels. The LLLWeek has over time become a milestone in the European education agenda, thanks to the support of civil society actors and of Members of the European Parliament. Building on the long-standing partnership between the Lifelong Learning Platform and the European Youth Forum, and on the successful experience of the European Youth Forum’s previous editions of the “Education Week”, this year the LLLWeek2016 will be run in partnership with the European Youth Forum. Activities and events will be organised around the three strands of the LLLWeek: Learning to Live Together, 21st Century Skills and Flexible Learning Pathways. The 2016 LLLWeek will also see the launch of the new Lifelong Learning Awards celebrating inclusive and creative initiatives from all over Europe. The idea is to bring together learners and educators, field workers and policy-makers, thinkers and political representatives and give them the opportunity to discuss today’s greatest educational challenges. The 2016 LLLWeek is supported by the Youth Intergroup and the Lifelong Learning Interest Group. The Erasmus+ Coalition prepared a number of recommendations for the improvement of the programme, in the prospect of the Erasmus+ mid-term evaluation. Building on the findings of the LLLPlatform 2016 Erasmus+ Survey and the 2015 Report of the European Youth Forum on Erasmus+ implementation, this event will be the opportunity for a constructive exchange of views between stakeholders, contributing to finding ways to make the programme even more successful in fitting the needs of its beneficiaries. “Rethinking education: Towards a global common good?” (2015), published in light of the definition of the Sustainable Development Goals for 2030 encourages public debate among education stakeholders. In this spirit, UNESCO and ICAE propose a space for consultation and discussion with regional civil society organizations and networks, and other actors working in the field of youth and adult education. To register for this event, please follow the special registration link. This event aims debate policy proposals on how to boost university students’ success in term of academic achievement, employability and active citizenship. The most adequate response to the migration challenge is undoubtedly a holistic inclusion strategy that gives priority to the socio-economic and political integration of refugees and migrants in the fabric of the host countries, as inequalities, segregation and social exclusion are on the rise across Europe. So how do we go from action plan to implementation? During the second evening of the LLLWeek2016, we invite you to discover the winners of the LLLAwards2016, in a festive background celebrating the partnership between the LLLPlatform and The European Youth Forum. Regional and local authorities have the urgent need to find new and sustainable approaches to the integration of migrants. Thus, they are increasing their cooperation and ensuring synergies between educational, social and employment policies, with a strong support of refugees themselves and civil society. This event aims to assess the implementation of the Paris declaration so far, especially at national level, and provide examples of how non formal learning approches in the field of intercultural citizenship and human rights education can contribute to the process. With the help of the European Youth Forum Pool of Trainers and non-formal education methodologies, this event will aim to foster a debate around the different approaches to citizenship education presented in the new YFJ Publication on the topic and identify possible core elements and synergies between the different stakeholders present at the event. In light of the New Skills Agenda, what has been done in the field to validate skills acquired through volunteering? From a practice to policy approach, this event will be the opportunity to present project results and how to take them further, such as the VaPoVo project aiming at helping volunteers-involving organisations to develop their own validation policy. The event will be the opportunity to present the Campaign #RecogniseStudyAbroad, show testimonies, and invite policy-makers and educational stakeholders to reflect upon the importance of making pupil learning mobility more accessible and recognised. Yes, the development of skills and competences through education is key for the integration. Creation of jobs and access to the job market are essential. But youth ownership and contribution to their own development are equally important. This Round-table will demonstrate how youth organisations are concretely combating youth exclusion, discuss how to scale up the existing best practices and offer more access to all young people. Those who attended the QUIZ in 2013 and/or 2014 know that you don’t have to be a quiz fanatic or walking encyclopaedia to participate… and have a lot of fun! while meeting Brussels’ diverse international community. And you will also be making a huge contribution: all income of the night will go towards a fund to allow less privileged volunteers of new and young AFS partner organisations (in south eastern Europe) to participate in the 2016 EFIL Volunteer Summer Summit. Quiz teams can have a maximum of 4 people and the venue can accommodate a maximum of 15 teams, so quickly call your friends and colleagues to make up a team! To register for this event, please follow the special registration link.